ADINA Structures is the leading finite element analysis program for linear and nonlinear analysis of solids and structures in statics and dynamics. ADINA Structures is routinely used in the automotive, heavy machinery, civil, construction, biomedical, oil and gas, nuclear, consumer goods, and defense industries, among others. It is often selected for analyses in which reliability and accuracy are of critical importance. ADINA Structures provides state-of-the-art stress capabilities for the analysis of solids and structures. The analysis can be linear or highly nonlinear, static or dynamic, and may include geometric nonlinearities, large deformations, severe material nonlinearities, load nonlinearities, and contact conditions. ADINA Structures offers versatile and generally applicable finite elements for solids, shells, beams, trusses, pipes, and special purpose applications. Material models for metals, soils and rocks, plastics, rubber, fabrics, wood, ceramics and concrete are available. ADINA Structures was developed to solve the most difficult nonlinear problems in diverse engineering disciplines. Continuous feedback from our customers for over 30 years has strengthened and enhanced the features offered in ADINA. ADINA Structures may be used as a standalone program for structural-only analyses, or it may be used in conjunction with other modules in the ADINA product suite for multiphysics applications, such as thermo-mechanical coupling or fluid-structure interaction analyses. Linear analysis applies to problems that meet linear assumptions: materially linear problems with small displacements, small deformations, and constant boundary conditions. If any of the above assumptions are not satisfied, a nonlinear analysis must be performed. ADINA Structures offers powerful solvers and element formulations allowing the solution of extremely large models with minimal CPU time and memory requirements. 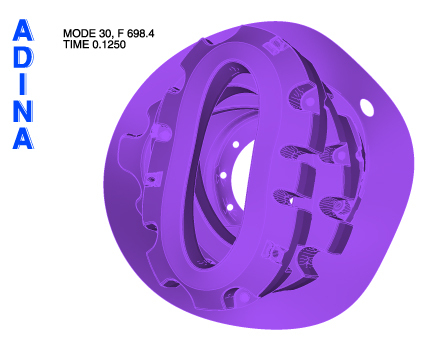 ADINA Structures is the premier finite element program for nonlinear analysis used to solve the most difficult nonlinear problems in industry and academia involving geometric nonlinearities, large deformations, material nonlinearities, load nonlinearities, and contact conditions. 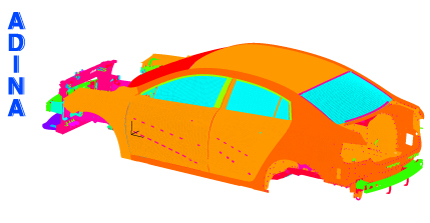 ADINA Structures has unique solution capabilities for nonlinear analysis providing great stability and reliability, thereby allowing the program to solve problems that cannot be solved using other commercial finite element programs. ADINA Structures offers solid elements (2-D and 3-D solid elements), structural elements (truss, beam, pipe, shell, spring), fluid elements (2D and 3D potential-based subsonic fluid elements), acoustic elements, and special purpose elements (alignment, connector, general). The same element can be used in both linear and nonlinear analysis. For example, the shell elements can be effectively used in the analysis of thick and thin shells, under linear and nonlinear conditions. User-defined elements can may also be implemented. ADINA Structures offers a rich library of material models for soils and rocks, plastics, rubbers, foams, fabrics, wood, ceramics, porous-media, and concrete. User-defined materials can also be implemented. ADINA Structures provides a variety of advanced contact algorithms for general contact conditions including frictionless and frictional contact, small sliding and large sliding contact, single-sided and double-sided contact, and self-contact. Coulomb-type and general friction models are supported. ADINA Structures offers implicit dynamic analysis, explicit dynamic analysis, and mode superposition time integration schemes. A unique capability of ADINA Structures is the Bathe method for implicit dynamic analysis. The Bathe method accurately integrates the low frequency modes that can be spatially resolved and automatically cuts-out the spurious high-frequencies that lead to chatter and noise. This approach results in remarkably stable and accurate solutions for linear and nonlinear dynamic analysis. ADINA Structures can be used to compute frequencies and mode shapes in linear and nonlinear analysis. The frequencies computed for nonlinear analysis may include the effect of geometric nonlinearities, material nonlinearities, bolt loading, mesh glue, and contact conditions. The frequencies can be automatically computed at any solution time during a linear or nonlinear analysis in statics or dynamics. ADINA Structures also offers frequency domain analysis capabilities including response spectrum analysis, Fourier analysis, harmonic vibration analysis, and random vibration analysis. ADINA Structures offers a wide range of analysis capabilities for the buckling and post-buckling response of solids and structures including the possibility of introducing small geometry imperfections prior to analysis. ADINA Structures also offers specialized elements for large strain bending of shells that can be used to accurately predict the post-buckling response of thin structures. Mesh glue to join dissimilar meshes. 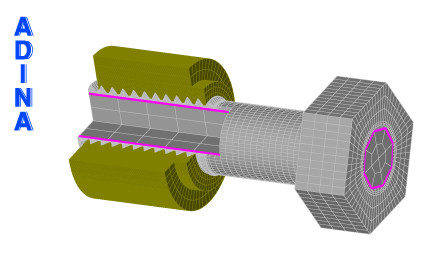 Bolt feature to model bolt tightening and bolt shortening in linear and nonlinear analysis. 3D-bolts and beam-bolts are supported. Bolt tightening sequences (bolt tables) can also be modeled. Element birth and death, and element death upon rupture to model processes in which material is added and/or removed from the structure, or to model material failure. Analysis zoom to analyze a detailed model of a local area of interest within a structure from the results of a coarse model of the entire structure in linear and nonlinear, static and dynamic analysis. Cyclic symmetry and periodic symmetry analysis for components where the geometry and boundary conditions are rotationally symmetric. It can be applied to static, dynamic and frequency analyses. The memory required for cyclic symmetry analysis is typically an order of magnitude less than that required for the full analysis, and the solution time can also be an order of magnitude smaller. Restart analysis to continue an analysis beyond its previous end point, or to change the analysis type, loads or boundary conditions or tolerances. It supports restarting from static to dynamic analyses as well as switching between implicit and explicit dynamics. Analysis switch to automatically switch the analysis type at any solution time. All analysis types are supported including static, dynamic, frequency, and modal participation factor analysis. For example, the switch can be from static to dynamic analysis, from implicit dynamic to explicit dynamic analysis, or a frequency analysis can be performed at any solution time during a nonlinear static or dynamic analysis. 3D-iterative solver to efficiently solve large models containing mainly higher-order elements in linear and nonlinear analyses, including contact. 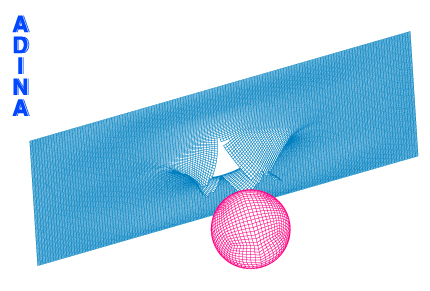 Fracture mechanics to compute the J-integral and stress intensity factors including the calculation of mixed-mode stress intensity factors. 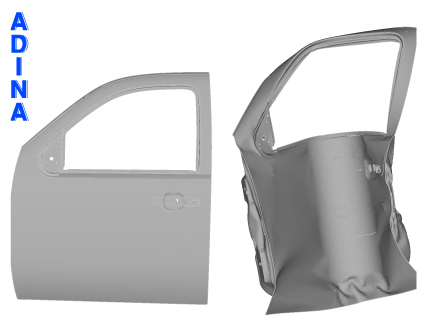 One or more cracks can be included in the model. Linear and nonlinear fracture mechanics can be performed on mapped or fully free-formed meshes around the crack front. Initial stresses/strains for all element types in linear and nonlinear analysis. Model reduction schemes such as substructuring, component mode synthesis, and general elements.